Thankyou for all those who attended my album launch last night it was just fantastic. With all profits of my new album going towards my “Glbt Community Chest Fund” which has be derived to help all those charaties that dont recieve any outside funding. On the goodside the feedback from album “In Da Club” is everyone thinks its a unique part of gay culture Sydneys and perhaps Australia’s first solo drag queen jazz and soul album, with reflections of the sixtys tv loung and beyond. Some of the things that I discussed are the lack of community support and support for small groups that are trying to make a difference and the need for the community to re-invent and re-educate the purpose of being together in our community. During the last week I have approached over 30 media organisations and papers and only one paper did actually print the story and with great thanks to Sx News paper for this. My listing fon same same was put on the bottom as usual, which I find a little disheartening but perhaps I didnt throw them a Free charatie Cd. But This is not about bitching, I can do that anytime. 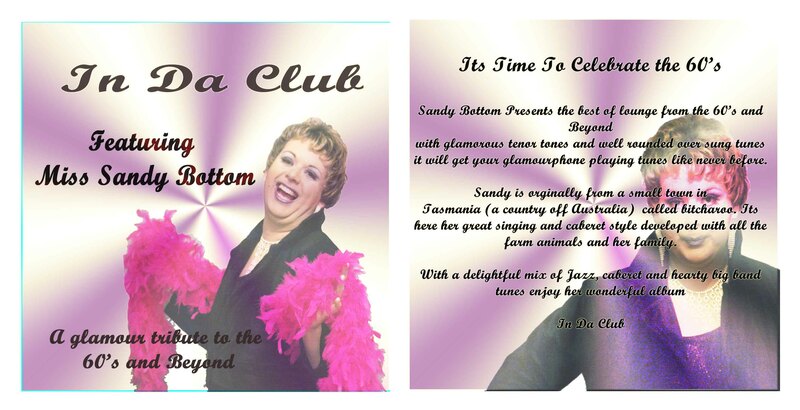 Once again for everyones support and I am now organising another promotional fundraising night for the wonderfull cd and if you would like to purchase a copy please email me at sandy@bottompromo.com , 100% of the profits go to the organisation.